James Anderson led England to victory in the first Investec Test as he took the last four wickets to fall in a steadfast spell of fast bowling on a nerve-shredding final day at Trent Bridge. But Australia took some silencing. A last-wicket stand of 65 between Brad Haddin and James Pattinson took a wonderful match, against expectations, into the afternoon session before Anderson struck for the final time. Haddin's valiant innings, 71 from 147 balls, deserved better than a dismissal by virtue of DRS. But it was better than an umpire getting it wrong; the system worked. Aleem Dar, the on-field umpire, understandably did not spot an inside edge about which only the wicketkeeper, Matt Prior, seemed convinced but England had two reviews in the tank and replays clearly proved Haddin nicked it. England raced into a jubilant huddle, a capacity crowd cheered with delight and Haddin, his helmet removed, looked pale with exhaustion and regret. 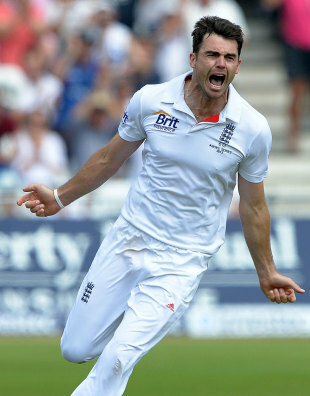 The importance of Anderson to England was doubly emphasised when he finally took a break. At that stage, Australia still needed 64 but, with Anderson withdrawn, the last pair immediately sensed they could hit their way to victory. Haddin, strong on the slog-sweep, was dropped at deep square leg by Steven Finn on 64, Graeme Swann's premature visions of victory banished. England were so shaken they ended the session with a shameless display of timewasting - Stuart Broad to the fore, under his captain's instructions, with needless boot repairs. The umpires made them have another over anyway. Much is made of Anderson's skill, but it was his stamina that was also to the fore as he produced a gruelling spell of 13 overs off the reel and was then asked for 11 more deliveries after lunch. Anderson was entrusted first with the old ball, then dismissed Ashton Agar, Mitchell Starc and Peter Siddle with the new. He has bowled 55.5 overs in the match, taking ten for 158 in the process, and passed Fred Trueman in England's all-time list during the game. Turn to your leading bowler when it most matters. In relying upon Anderson, England's captain, Alastair Cook, was returning to basic principles, and aware also of his excellent record at Trent Bridge but he would have had a few qualms about giving Anderson such an arduous spell with the Lord's Test only four days away. There is no doubt who is most invaluable to England in this Ashes series. It is not Cook, Jonathan Trott at his most unflappable or even Swann, whose superior spin bowling gives England an obvious advantage. It is Anderson. Once limited if the ball did not swing conventionally, he has grown into the best dry-wicket pace bowler in the world. All three pre-lunch wickets fell to catches by Cook at first slip, as Anderson found away swing from both around then over the wicket. The best of them was a diving effort to his right to dismiss Peter Siddle, atonement for dropping Siddle in the same position in Anderson's previous over. When you have set a field with a solitary slip - generally justifiable on this low pitch, but not necessarily when Siddle was having a lash - it is advisable to develop spring heels. Trent Bridge has lapped up one of the great Tests. It was sold out for all five days, and with Australia, six down overnight, needing another 137 to win, there was enough in the game for the vast majority to turn up for the final phase of a gripping Test. There is more than one way to seek to turn a Test that seems to be tipping against you. Agar, with the eagerness we have already come to expect, fancied scampering a single or two to get the intensity up. The old timer, Haddin, wanted to do nothing of the sort, preferring to hunker in and communicate a sense that Australia would not yield. Twice, Agar almost ended up in mid-pitch, leaving his older - and slower - partner to have a calming word. The ball was 71 overs at start of play, the floodlights broke through the morning haze and a slow pitch was as inhibiting for the batsmen as ever. Cook was satisfied enough to watch Australia make painstaking progress, so cautious that he even set a long-on and long-off for Swann's offspin, but it was deadlock. In 11 overs, Australia made 17. Haddin slog-swept Swann for four, Agar, driving with big backlift and loose limbs, deflected Anderson to the third boundary. After 82 overs, Cook had seen enough and took the new ball. But Anderson, his go-to bowler, had already bowled five overs with the old one. Finn had become an option that Cook did not entirely trust. Swann's threat was subdued, his home ground still reluctant to bear favours. Anderson faced a footslog. If the harder ball did not swing, Australia had an opportunity to step up the scoring rate for more than an hour before lunch. Instead, with the fifth over of the new ball - Anderson's eighth of the morning - Agar fell to Anderson. Agar prefers to stay leg-side of the ball, foot not always to the pitch, to free up his off-side drives; Anderson, shaping the ball away from around the wicket, found the perfect retort and Cook held the edge at first slip. His 14 had taken 71 balls, in sharp contrast to his first-innings spree, but it was not just the increased pressure second time around, but could also be put down to the debilitating nature of the pitch. Australia's lower order is no pushover: their bottom three - Starc, Siddle, and Pattinson share a combined Test average of 70. But Anderson had not finished. Starc received another excellent delivery which left him - this time from over the wicket - and Cook again held on. With eight down, and 100 still needed, Siddle decided that adventure was called for. Cook missed an inviting opportunity to his left at slip, but then caught a blinder in Anderson's next over. At 240 for 9, Anderson finally had to stand down. With 70 needed, Haddin spotted his moment. A concerted assault upon Finn, who has been thoroughly out of sorts throughout this Test, was Australia's last remaining hope. He took 15 off Finn's first over, passing 50 in the process, crunching him over the leg-side on three occasions. Finn looked insipid. His second over went for nine, including four byes. Broad responded better. England could afford one bowler to be broken; they could not afford two. Pattinson slogged Swann over midwicket for six as the last-wicket stand reached 50. England turned to Broad, but any longing to return to Anderson had to wait when he tried to stretch and limped off to the pavilion. England then missed a run out with 28 needed, Haddin and Pattinson caught in mid-pitch as they became mixed-up over a leg-side single, only for Jonny Bairstow's shy at the stumps at the keeper's end to miss the target. Finn allowed a challenging running catch to slip through his hands at deep square-leg with Haddin 64 and 26 needed. Watching from the Australia dressing room, the coach, Darren Lehmann played with a stress ball. At lunch, a late lunch, too, this Test would just not lie down. A lie down was probably just what Anderson fancied. But he roused himself for a final time and the faintest of nicks - seen on Hot Spot, heard on audio, unofficially spotted on Snicko and perhaps even suspected by the batsman himself - put England 1-0 up in the series.